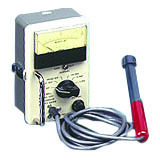 Microwave leakage meters and area monitors are specifically calibrated to detect and measure microwave energy. These detectors aid in protecting personnel and assist in meeting government regulations for microwave radiation. 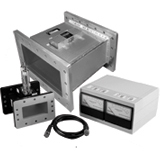 Richardson Electronics offers panel mount, rack mount, and hand-held microwave leakage meters and area monitors for both 2450MHz and 915MHz systems. Our engineering staff can assist you in choosing the correct device to meet your safety requirements.